Cleaner OilFlux™​​ BTI additive is focused on two different aspects of crude oil production and flow stream delivery: tanks and tankers where the crude oil mass is a residual product residing in the bottoms and sides as a lost profit opportunity, and on the aquatic and terrestrial environment where the crude oil mass is a profit resource out of place which also contributes to HSE issues and increase costs causing profit loss. Common cleaners and methods in use today employ many different approaches depending upon which aspect of crude oil requires cleaning: tanks and tankers or the environment. The cleaner types and methods can be any one or more in combination of chemicals, mechanical, heat, water salt/fresh, and organic compounds. OilFlux™​​ BTI additive chemical employs new chemistry containing highly active specially formulated ingredients for the cleaning both aspects of crude oil cleaning tanks and tankers metallic surfaces impregnated with oil, grease, crude oil, as well as their derivatives and the natural environment. OilFlux™​​ BTI additive efficacy extends equally to water soluble residues, as well as to the soluble in solvents, for the perfect balance of Hydrophilic-Lipophilic. OilFlux™​​ BTI additive does not have a risk of explosion due to the phenomenon of static electricity since the OilFlux™​​ BTI additive emulsifies with fresh water or even with seawater and the emulsion is non-flammable. OilFlux™​​ BTI additive for seawater or fresh water cleaning, is applied in a mixture containing 95-99 parts of freshwater or seawater. OilFlux™​​ BTI additive can be used in all types of tanks, storage tanks, port installations, crude oil transportation sea tankers, barges, railcar and truck tankers, cisterns and etc. OilFlux™ W20 can be used and followed up with BTI for Crude Oil Washing (“COW”) to reduce Remain On Board (“ROB”) in accordance with MARPOL 73/78 or other Load On Top (“LOT”) management practices. This practice reduces the water soluble residues which remain. OilFlux™​​ BTI additive cleans the environment and recovers crude oil to increase profits. 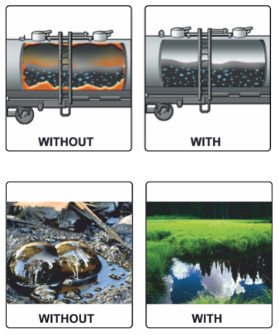 After applying the BTI product over the crude oil spill, it can be immediately seen that the extension of the size of the crude oil spill reduces considerably, and at the same time the equipment that is impregnated in the extraction of the crude oil can simply be cleaned with running water since the crude oil no longer has the same characteristics. 1- Arnold, K. and Stewart, M. 1991. Surface Production Operations. In Design of Oil-Handling Systems and Facilities, Vol. 1, Ch. 7. Houston, Texas: Gulf Publishing Co.
2- Oil-Water Separator Process Design. 1975. Manual on Disposal of Refinery Wastes, Volume on Liquid Wastes, Ch. 5. Dallas, Texas: API. 6- Faucher, M. and Sellman, E. 1998. Produced water deoiling using disk stack centrifuges. Paper presented at the API Tech Chapter 1998 Produced Water Management Forum, Lafayette, Louisiana, November. 7- Neff, J.M. and Stout, S. 2002. Predictors of Water-Soluble Organics (WSOs) in Produced Water—A Literature Review. Washington, DC: API. 8- Caudle, D.D. and Stephenson, M.T. 1988. The Determination of Water Soluble Organic Compounds in Produced Water. Report for the Offshore Operators Committee Task Force on Water Soluble Organic Compounds in Produced Water.